Update March 16, 2016: With more requests coming in I’ve had to make up some more tools. Currently there are 3 units in stock ready to ship. I recently set up an Ebay account but they charge too much money to sell things there so please contact me directly (see below). NOTE: if you are having issues with the serpentine belt “walking” off the A/C pulley or any of the other accessories there’s a very good chance your tensioner is buggered. This happened on my ’96 9000. The rubber bellows on the tensioner had become torn and water got into the cylinder and damaged it. I have a few of these made up and enough material on hand for a few more. If you are interested in obtaining one ($35USD incl. shipping in USA) please send a message to the administrator at jeffs@fairwayacademy.org. Update, March 2014: Due to demand I have made another batch of these and currently have a couple extra tools left over for immediate shipment if anyone is interested in obtaining one. Glad to see there are still some 9000’s running around out there. Also I’ve had some feedback from users about using the tool, see below for instructions. Belt tensioner tool in place, ready to compress the automatic tensioner. 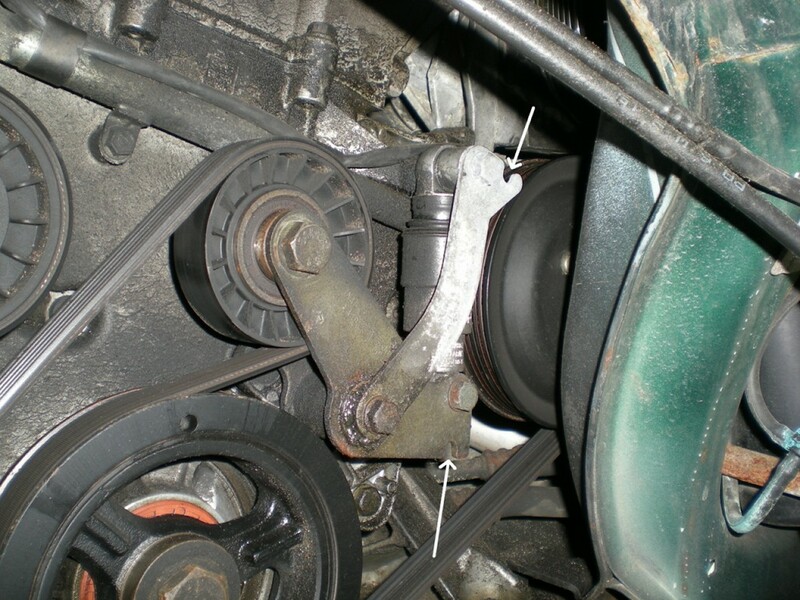 Once properly fitted to the tensioner bracket, use a ratchet with an extension to gently tighten the tool, compressing the tensioner just enough to relieve the tension on the serpentine belt. NOTE: THE TOOL CAN BE DAMAGED BY OVERTIGHTENING! 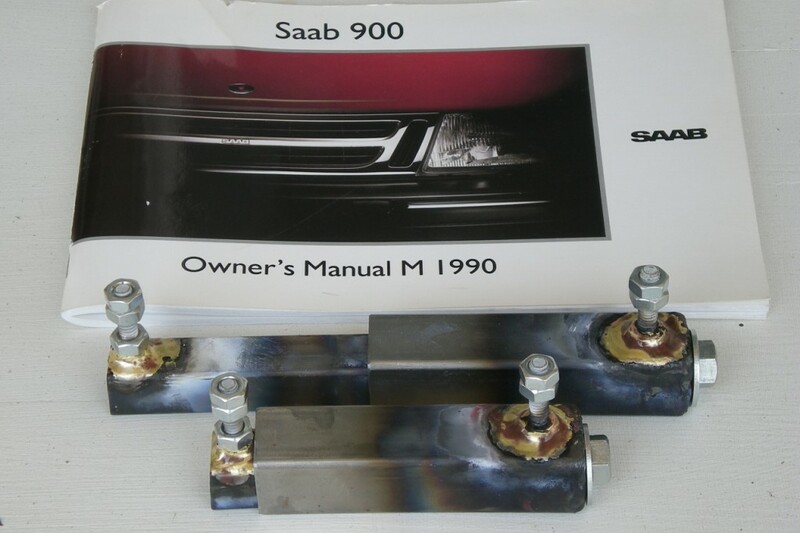 I purposely designed this tool to self destruct if abused in order to prevent damage to the belt tensioner and its mounting brackets. You bend that bugger and you’ll never get the belt to stay on and you’ll have to replace the whole kit. Note also that the tool was designed to be used only one way, with the bolt on the bottom as shown. If you are cheating and trying to use it from the top without taking out the wing liner you risk damaging the tool since it won’t fit as closely to the bracket as it will when oriented with the bottom down. 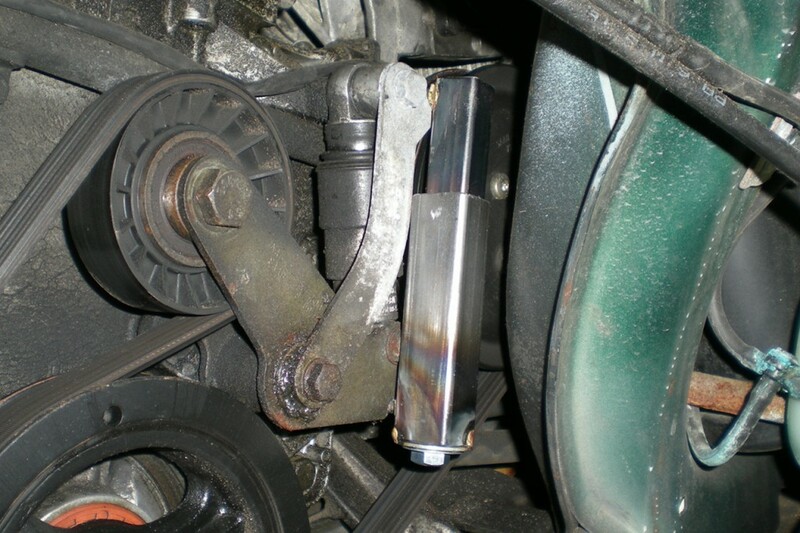 Note in the picture above how there is a bit of an offset between the moving and fixed parts of the tensioner bracket. Also if you are replacing the idler pulley on the tensioner arm loosen the bolt (it has left handed threads by the way) prior to attaching and using the tensioner compression tool to avoid damaging the tool- sometimes it takes a LOT of torque to get that bolt loose, and you’ll need the belt tight in order to have something to work against.